Vivah (www.hinduvivah.org) is a US based non-profit organization whose charter is to facilitate the meeting of Hindu singles for the purpose of matrimony. It is engaged mainly in the arranging of meetings where Hindu singles get a chance to mingle with like minded suitors who are implicitly ready for marriage. These meets help break the ice and introduce Hindu singles to each other, at which point Vivah’s work is done, and these singles are left with our best wishes to explore and select a life partner from amongst the singles they meet at our events. Vivah requests Hindu singles to not use our event to date for dating’s sake, we hope that our services are used by those that are serious and contemplating marriage. Since Vivah is funded by the Hindu community, it’s events are free of charge to all its attendees. Research shows that in-person meets have a much higher chance of leading to finding of a partner suitable for marriage; than do online matching/dating sites based strictly on professed personal profiles. At some point in the future if some kind of online presence can complement these in-person meets, Vivah is open to exploring that avenue. Please look for our events in a city near you. We are planning events in most major cities in the US, with some planned in Canada later. It is our hope that plenty of out of town attendees will attend events in all cities, thus providing a diverse choice for all. It is also anticipated that Hindu singles from overseas will consider participating if they are planning to visit the US. Providing a wide choice is key to our singles finding a suitable match. While we are open to adopting any format that works, we have currently adopted the ‘round robin’ format in these meets, whereby every gal briefly meets every guy in attendance. This method has been found to help find that true love that singles will otherwise not consider based on a first impression alone. Besides, this method has the advantage of involving everyone, even the shy ones. 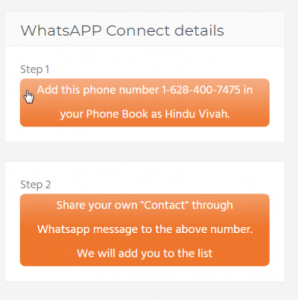 We hope that Hindu singles will find our services helpful, and will consider giving back by promoting our efforts, help with testimonials, and volunteer to help in our efforts.